This is a lightly edited set of notes for a talk I gave on June 27 at the Socialism 2014 conference in Chicago. The title is a tribute to the book by Michael Tigar, from which I drew heavily (see references at the end). 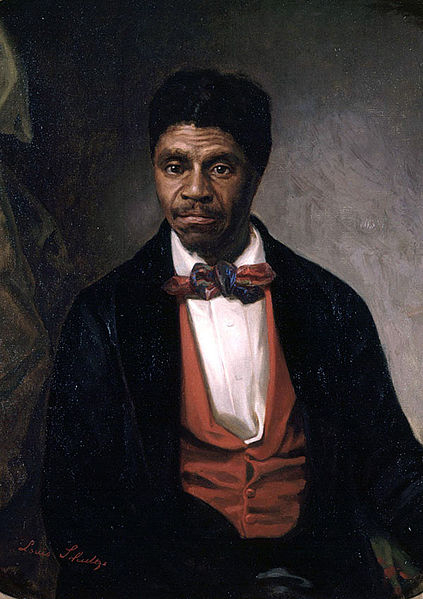 Dred Scott was born into slavery, but he filed a federal lawsuit for his freedom because he had crossed into a state where slavery was illegal. The Supreme Court dismissed the suit in 1857 on the grounds that Blacks were not US citizens endowed with rights and thus had no “standing” in federal court. Digital image ©1998 Missouri Historical Society, St. Louis. The law is a big topic, and so is the rise of capitalism, so I’m going to narrow the scope of my discussion in a couple of ways. Number one, I’ll focus on the American tradition of law, with a fairly long look at its European roots. That’s not because Europe and North America were the model for legal developments in other parts of the world. Just the opposite. Things developed differently around the world after Western capitalism got started, so I wouldn’t know what to say in just 40 minutes. Tracing just a bit of the American story will be more than enough to talk about. The second way to narrow the focus is to concentrate on the laws relating to business, including things like contracts and property law. Those sorts of laws are interesting because they point toward the economic relations that form the basis for our social life. Before I give the outline of the talk, I should first say something about the significance of property. Property may appear to be a relation between a person and a thing, but it’s really a relation between people. Under capitalism, most property relations are stripped down to simple terms: When I own something, you don’t. I am free to use the thing, to sell it, or to keep it and leave it to somebody else when I die. Crucially, I have the legal power to stop you from doing any of those things with it. Since property is a social relation, new varieties of property tend to come to prominence when social relations are shifting — especially as classes are rising or falling in relation to each other. Today, I’ll focus on four historical periods when the law shifted in response to social developments. First, I’ll look at the original roots of capitalist law, which lie in the expansion of trade in the late Middle Ages. The form of property was goods that could be transported by land and sea. The laws themselves regulated life within the moneyed classes that were involved with trade, such as merchants and bankers. In the second period, the laws that regulated the trade of moveable goods were extended to cover the land. This movement reflected the rise of the bourgeoisie from its small beginnings, and it was a direct attack on the social position of the landholding noble class. For the third period, I’ll jump from Europe to colonial Virginia, where the landholders were doing pioneering legal work to deal with people as property — as African slave labor became indispensable to the Southern economy. The fourth period, our own period, is dominated by wage slavery. The relevant form of property is labor power. Workers are legally free and equal to the bourgeoisie, but the predominance of these legal relations actually corresponds to the social ascendancy of capitalists over workers. So, it’ll be a quick social history of four types of property — goods, land, slaves, and labor power. Let’s start with the commercial life of the towns of the European Middle Ages. The people in the town were “bourgeois,” a term that was already in use by 1007. It simply means “town dweller.” Some of them made a living just by buying and selling — the class of merchants. Merchant wealth was embodied in money and also in those sorts of goods that could be picked up and transferred to someone else. But most economic life in the Middle Ages was agricultural, as farmers worked on the estates of landholding nobles in semi-slave conditions known as serfdom. The transfers of wealth from serfs to nobles often involved farm produce, not money, and the serfs performed that work in order have the right to till the land for themselves. They made a livelihood, but they weren’t in business. The merchants relied on bankers to finance their bigger purchases. Bankers, of course, handle only money, not goods, and they make their living by charging interest. Together, you could call these two groups a capitalist class, because they lived by trying to make money into more money. There wasn’t a capitalist system, however, for two reasons: Number one, the overall system was feudal. The nobles were dominant, and their wealth was in land, not money. They exploited the serfs because they had the power of the sword. Number two, the system wasn’t capitalist because there was no working class to be exploited by the capitalists. The capitalists did have big piles of money, but they weren’t yet using that money to control production. Law comes into play in situations of conflict that arise often enough that people can give a name to the offense — such as murder — and maybe start to distinguish varieties, such as manslaughter vs. aggravated murder. Lots of ritualized activity can begin before people develop very sophisticated ideas about it, let alone legal ideas about what to do when things go wrong. Legal categories, legal institutions, and legal remedies are invented to regulate activities that are already going on. As Marxists would say, practical activity is what generates the need for ideas. Legal ideas don’t just come out of the blue and start to determine what people do. This is pretty obvious when it comes to law, because new laws and new legal ideas are so often invented to deal with concrete cases that haven’t been anticipated by the legal system. Social practice may drive the creation of new legal ideas, but once the legal ideas are updated, they can have a reciprocal effect on future practice. That’s because the legal categories that people come up with to conceptualize social reality — I mentioned manslaughter vs. aggravated murder — are not the only way to carve up this reality. Things can be re-conceptualized or clarified, and when they are, the new concepts can be shared socially and begin to restructure people’s behavior in a synchronized way. For this reason, the development of laws and model cases can make economic rituals even more standardized and predictable. And that’s good for business. In the Middle Ages, much of the law was of the do-it-yourself variety, as different legal traditions developed within each town. There was also a widespread legal tradition — the law merchant — that evolved out of trade between towns. The law merchant covered basics such as contracts between merchants and credit relations between merchants and bankers. Another source of commercial law came from Rome. The ancient Romans developed sophisticated trade practices and laws to go with them, such as ways to pool the resources of many parties to form corporations that could take on big projects. When the Roman Empire disintegrated, the Roman legal system ceased to operate in Europe. Roman law didn’t return to Europe in a big way until the Crusades, which lasted from 1095 to 1291. One of the reasons for trying to capture the Holy Land was to take control of a major trade center. The Middle East connected the major trading cities of northern Italy to the vast Muslim trade network that extended to East Africa and most of Asia. Among Arab and Eastern Christian (Byzantine) traders, Roman law was a living tradition. The Crusades turned out to be a military failure for the West, but the close engagement with the Muslim-dominated trade networks provided Europe with a ready-made set of laws to deal with commerce. As I said, law develops out of the need to conceptualize practices that are already going on, but once those legal concepts develop, they can help restructure future practice. In the case of Roman law, there was a whole body of past economic practice — of the Romans themselves and then later of the Muslims and Eastern Christians — that was quite sophisticated and drove the creation of this legal tradition. The Crusades thus exposed a bunch of European traders to a more-advanced system, and its legal ideas allowed them to reconceptualize and restructure their own behavior fairly quickly. The new legal forms helped to step up the pace and volume of commercial transactions — just when the merchants got more engaged with the huge Eastern trade network. Along with laws, Europeans brought back methods of business accounting from the East — not to mention the Hindu-Arab zero, which allowed businesspeople to discard the cumbersome Roman-numeral notation. All of these factors helped Europe’s moneyed classes to grow in wealth and social weight. For a time, the return of Roman law to Europe helped expand the political role of the Catholic Church, because church officials could read the Roman law books, which were in Latin. For this reason, the merchants went to the Church’s ecclesiastical courts when they wanted to resolve disputes over long-distance trade. For disputes within the towns, they used local legal traditions. This all brings up a puzzle about how these courts enforced their decisions. The real armed force at the time was the feudal nobility, but the merchants didn’t want the nobles mixed up in their business. The city-states of Italy were developed enough to support a local state apparatus, but most of the towns weren’t like that. They didn’t really have a state, in the sense of a special body of armed men that could apply physical coercion. And there certainly wasn’t a state that stretched all across Europe to enforce the decisions of the far-flung ecclesiastical courts. To understand how legal coercion worked, we have to realize that these disputes took place within a single class — a class that was not yet divided by large disparities in wealth. This meant that legal enforcement could come from collective coercion. People could refuse to do business with somebody who ignored the order of a town court. Ecclesiastical courts could also call forth collective pressure. If the offender was unrepentant, the Church could call on Christians to shun the offender — to cut off all social connections — which would certainly end somebody’s business career. Most of the offenders also thought they could go to hell if they persisted in sin, so they had a special incentive to obey the Church courts. These legal processes began to change later with the rise of kingly authority, but let’s sum up some points about this earlier period. The economic life of the bourgeoisie made them legally free and equal to each other. Many of them were former serfs who had gained their freedom by running away to the towns from the noble estates. In economic transactions, they were also free because they could walk away from any business deal they didn’t like. You can’t enter a contract against your will. These folks were also legally equal — not because everybody had exactly the same wealth as everybody else — but because they had rights to their own wealth that were equal to everybody else’s property rights. That meant that they owned their property free and clear of any obligation, so they could dispose of their property as they wished. The last thing to say about this period is that the relative equality within the class gave them the idea that the law was like the rules of a game. The laws set the boundaries of behavior within the marketplace, and people generally observed the rules because they didn’t want to interrupt the economic game by going to court. The object of the trade game, of course, was profit, and if all the players stuck more or less within the rules, they could keep the game going, and they all stood a chance of making some money. I’ll reconsider this game metaphor as we go on. In the next period, from about 1200 to 1500, the kings were on the rise, and the bourgeoisie was engaged in sharpening conflicts with the other classes. I mentioned that the bourgeois were forming ideas about laws that applied only among themselves. As a matter of fact, the laws of the Middle Ages really did just apply to people of the same social rank. Some laws covered the rights of nobles, and others applied to serfs. The skilled craft workers in the towns formed guilds with their own rules to regulate their work and mutual relations. The law of the merchant bourgeoisie dealt with voluntary exchange relationships, and the exchange values or prices of their goods were set by the impersonal market forces of supply and demand. Although market relations governed exchange, they didn’t govern production. Production relations were governed by who you were — by your social rank or status. The quantities of farm goods or money that serfs owed to the lords was set by the custom that governed the obligations of their rank. Other obligations worked the same way. Serfs were obliged to stay on the land and not strike out on their own. In return, the nobles provided a measure of military security and gave the serfs the right to use the land for their own benefit and to pass it on to their children. The relation between lord and serf gave both of them particular rights to the land. The land, therefore, was not the sort of thing that could be owned free and clear of obligation and sold to some anonymous buyer. It was all very personal, not a bit voluntary, and the market had nothing to do it. The relations of production among craftspeople were also personal. The shoemakers’ guild would determine how many pairs of shoes were to be made, how the work would be portioned out among masters and journeyman, how much everybody would get paid. The prices would be set according to a historical conception of the “just price” for shoes. The rules that governed market exchange could only be extended to cover economic production through a series of struggles that overturned the prevailing production relations. When these struggles began, of course, the bourgeoisie didn’t know that that’s where things would lead. They were just standing up for their interests against the other classes. The bourgeois classes gained important allies when the kings rose to power, especially in England and France. Kings came from the most powerful noble families, but they established an interdependent relation with the bourgeoisie. When a king extended royal authority over a large territory, he expanded the range of reliable commercial transactions — partly by imposing a uniform legal system. Collective legal enforcement within the bourgeoisie gave way to coercion by a state power. The broader scope of regular commerce helped the bourgeoisie get richer. In return, the bankers financed the army and state bureaucracy, while the moneyed classes all paid taxes to the king. The kings and the bourgeoisie also had a common enemy in the lesser nobility. These nobles were rivals to the king, but they also made a hobby of robbing the merchants who transported goods through the nobles’ land. Kingly authority stepped in to stop that. In short, the bourgeoisie helped the kings to extend their power, and the kings helped the bourgeoisie to expand their wealth. Now I’ll focus specifically on England because it was Henry VIII who made the first major attack on feudal property. This wasn’t a case where the law operated as the rules of an ongoing economic game. It was a set of royal decrees that came down like a hammer and changed the game. From 1536 to 1539, Henry VIII seized the lands that were controlled by the Catholic monasteries. Henry, of course, already had a dispute with the Pope over a royal divorce. His basic motive for taking on the monks, however, was that he wanted their land. It was a lot of land — estimates range between one-sixth and one-quarter of all the land in England. In the following years, he sold off pieces of it to his friends in order to finance his wars in Scotland and France. It was such a large chunk of land that the sales of it helped establish hypothetical market values for all of the land in England, even if the rules of feudalism continued to impede free trade in land. I think it was similar to what’s been going on in China. It’s only recently that rights to some of the land have been bought and sold, and it has already produced a couple of important effects. For one, it has made land into an object for speculation. For another, it has led the Chinese to think of land as an investment — and thus to price the land according to the money that might be made from using it. Both of those factors provide incentives to bring more and more land onto the market. Because land can be an investment, it’s not just any commodity, a product like a cotton shirt. Land is a means of production. When land became a commodity, capitalists could begin to control some production and not to just trade the stuff that was already produced. In England, it turned out that the most profitable use of the land was to clear out most of the peasants, grow sheep, and sell the wool. There were already some commercial sheep farmers before Henry VIII became king, but the commodification of land gave the process a major boost. The dislocation of the peasants was to stretch over hundreds of years and became known as the “enclosure” movement because the landholders were closing off the common land that traditionally had been available for the peasants to use. Enclosure happens when the landholders claim the right to control the land free and clear of any obligation to the people on the land. In other words, land could only become a commodity through struggles that ultimately destroyed feudal rights and feudal relations of production. The laws of rank and status were supposed to give way to the laws of contract. As the Russian legal theorist Evgeny Pashukanis put it, market relations give rise to an “abstract legal subject,” somebody who has full rights to some piece of property and acts in the marketplace as an abstract property owner, not as a lord or a serf or even a bourgeois. And as the royal state rose to power, so did a new bit of ideology about the laws. Laws were still like the rules of a game — marking out the bounds of acceptable behavior. The rules, however, were no longer enforced collectively. The state was now to serve as a referee that stands above us all. Of course, this was precisely the time when the state was revealing that it was not neutral at all. The kings were using the law as a weapon in a protracted war against the lesser nobility. In this war, the peasants were collateral damage. For its own part, the bourgeoisie was using contract relations to elevate itself at everybody else’s expense. Contracts are peculiar because they are private agreements that entitle each party to call upon the state to apply coercion to the other party. Private agreements are thus backed up by public authority. Contracts are voluntary because either party can walk away without making a deal, but folks do not approach agreements with equal bargaining power. Let’s say a landowner negotiates with a peasant over the rental of a piece of land. Mister Moneybags shows up with a contract already in hand because his lawyer wrote it. There may be laws that protect the peasant’s rights in various ways, but the peasant doesn’t know that, and besides, the contract has a bunch of clauses that say that the peasant is waiving all those rights. In the end, the peasant signs the contract because he needs to keep his family from starving. The legal system ignores people’s social status in the name of equality, but the system actually enriches the people who start out with the superior social position. This is not something that radicals in the 19th century discovered. People understood at the time — 500, 600 years ago — that legal equality could be a tool for the oppression of the weak. As the years passed, the bourgeoisie developed an ideology of freedom and equality that corresponded to a conscious rejection of the very existence of feudal rank and status. That’s the banner under which the bourgeoisie and its allies would fight in the English Revolution in the 17th century. Instead of continuing the story in England, I’m going to skip to the New World because the English Revolution took place just when a slave system — a new legal system of social rank — was developing in the English colonies. The records of the Virginia colony make it clear that the first 20 Africans who arrived in 1619 were not slaves. They were indentured servants who would become free at the end of a certain period of service. Lots of Europeans in the colony shared the Africans’ status, although there was an important difference already: Africans were in the New World against their will. Lifetime servitude could be imposed on an indentured servant for the crime of running away, but there was no hereditary, lifetime servitude connected to a conception of race. In fact, slavery was illegal under English law. A person simply couldn’t be the legal property of somebody else. As a result, when the colonists developed slavery as a social relation over the next 80 years, the corresponding legal structure was a local improvisation. Virginia’s new laws became one model for slave laws in other Southern colonies. Later, the English founders of the Carolina colony — and the French and Spanish rulers of Louisiana — developed legal frameworks that provided variant models for the American South, but here I will continue to focus mainly on the Virginian experience. There were a couple of motivations for converting Africans into hereditary slaves. One of them had to do with a chronic labor shortage in the colonies. In the second half of the century, the shortage became more acute as the supply of indentured servants from places like England and Scotland started to run dry. As a result, the price of these servants was rising while the prices of kidnapped Africans were still pretty low. The second major motive for inventing racial distinctions was that white and Black servants developed a habit of conspiring together to run away, and, as time went on, they joined together in direct revolts against their masters. So the racial distinction that made economic sense also made sense as a way to control the working population — as a policy of divide and rule. When the law began to recognize that Africans could be treated as property, there remained the question whether they were also still legal persons who could themselves enter contracts, own property, testify in court, etc. One of the first legal puzzles was how to treat the child of a white master and a Black slave woman. Under English common law, the child’s social status followed the status of the father, so the child would be free and entitled to inheritance. For the masters, this brought up the uncomfortable possibility that free children would be raised in slave quarters (assuming that their mothers would be responsible for raising them) — and then demand their rights when they came of age. As time went on, slaves were stripped of more of the rights of persons. Eventually, Africans lost the most basic right — the right to life. The law did not consider it murder when a master killed his own slave. The transformation was complete. People of African descent had been demoted from being productive workers to the legal status of means of production. I should add that the laws governing slaves never became consistent. By the time of the American Revolution, slaves had the status of property. Nevertheless, when it came to writing the Constitution, the masters wanted to be apportioned as many representatives in Congress as they could get, so they wanted their slaves to be counted as persons, not property. The Northern delegates refused, so they all settled on the counting each slave as three-fifths of a person. Later, when it came time to write the Bill of Rights, the masters changed their minds and said slaves were property, after all. You see, the Fifth Amendment guarantees that no person can be deprived of life, liberty, or property without due process of law. But the slavemasters were in the business of depriving Africans of liberty, and they were free to deprive them of their lives. For that reason, the Fifth Amendment defends the slavemasters’ right to treat people as property — rather than defending the slave’s right to life or liberty. Everybody who worked on the Bill of Rights understood that this was what it meant. Right up to the Civil War, the law treated slaves as persons or property according to what served the interest of the slavemasters at the time. This is a reminder that the law is not a simply a mirror of social relations. It’s not a complete or transparent framework for the way that real-life social transactions play out. When it comes down to it, the law is a tool that can be used against others — at the convenience of those who are empowered to use it. And sometimes, of course, the oppressors simply the ignore the law. Before we look at wage labor, let’s tie up some of the themes I’ve introduced so far. We’ve looked at the development of three forms of legal property: tradable goods, land, and slaves. Each kind of property became prominent because of developments in class relations. For the trade in goods, most of the development occurred among the merchants themselves, plus related urban groups such as bankers. These are the relationships that make it most plausible to characterize the law as the rules of a game. All of the participants play the game willingly, and there is a clear object shared by all players, which is profit. Later on, land became a commodity through a long struggle by the merchants and their allies against the feudal nobility. The destruction of feudal social relations also displaced large numbers of peasants from the land. The process of class conflict gave rise to new ideology. By this I mean a set of ideas that justifies the role of an exploiting class and simultaneously mystifies what’s really going on. Ideas about the law became elements in a partisan case for the new society that was emerging out of the old. The ideologists eventually included some brilliant bourgeois thinkers, such as Thomas Hobbes, John Locke, Rousseau, Jefferson and Madison. They didn’t agree on everything, but we’re still living with a lot of their ideas. One is the concept we’ve seen — of abstract legal persons who have equal rights to own things and the freedom to dispose of them as they wish. These ideas expanded into a concept of free and equal citizens, whose freedom makes them into separate entities that possess a variety of rights beyond property rights. The only legitimate way for these person-entities to come into social relations is through voluntary agreements that are modeled on contracts. Finally, the game theory of the law got expanded to include a referee. That’s a centralized state that supposedly balances the interests of the different elements of society. First: People are not isolated entities but are always embedded in social relations that are mostly not of their own choosing. Second: The game metaphor of the law breaks down because participation is not voluntary, because the class divisions in society give the players different objectives, and because the state is not neutral between the players. The third type of property I talked about was slaves. Africans became slaves because they lost a series of struggles, starting back when they were captured in Africa. Slavery in the English colonies created new puzzles for the ideologists. How can a person be somebody else’s property if everybody’s free and equal? And how can you claim that you’re abolishing legal rank and status when you’re passing law after law to define a new subordinate social rank? They didn’t solve these puzzles by taking concepts from the law. Instead, they developed the ideology of racism. In a nutshell: Some people are just not quite people… and it’s hereditary. The ideology is biological, not legal. Later on, that meant that the ideology of white supremacy didn’t have to change fundamentally when the legal rank of slavery was abolished. That brings us to the working class and to workers’ own form of property — labor power. That’s the thing that workers sell to the boss in return for wages. Like other forms of property, labor power is easiest to understand when we look at the social history that made this kind of property important. First and foremost, the modern working class is a product of social dislocation. The crucial characteristic of workers is that they’ve been separated from the means of production. They don’t own land that would allow them to support themselves through farming, and they don’t own the tools or workshops that would allow them to be independent producers of goods for sale. The American working class was formed out of three major sources — three groups of people. One group is the African Americans who became wage workers following emancipation. They had already lost their means of production when they got kidnapped in Africa. Another group includes the skilled artisans who lost their independence and had to start hiring themselves out as wage workers. Third — the largest group — includes those who formerly worked the land for their own subsistence. They took up wage labor when political, military, or market forces made it impossible for them to keep farming. For African Americans, wage work was a step up from slavery and sharecropping. As for the skilled artisans, a few of them did become industrial capitalists, but most lost their independence because they couldn’t compete with the industrial producers. This happened mostly between about 1760 and 1860. As for the former farmers, some came from American farm families who couldn’t make ends meet in the decades following the American Revolution. Many more came to the United States to find wage work because they were refugees from the enclosure movements in England and Scotland. As industrialization proceeded, it greatly expanded the waged workforce, drawing from a virtually endless stream of people who got spun out of farm work all over Europe. That’s because capitalism has inflicted some form of enclosure upon peasants wherever the system has spread. On the West Coast, there were successive waves of Asian immigration in the 19th century, but it was more restricted and stage-managed by the bosses than was European immigration to the East Coast. Once workers are separated from the means of production, the only productive material that they control is their own brains and bodies. But they don’t sell these to the capitalist. That would make them slaves. Workers’ brains and bodies give them their capacity to work — that abstract quality that Karl Marx called labor power. So workers sell their productive capacity to the bosses for limited projects or limited stretches of time. When the bosses monopolize the means of production, and masses of workers must sell their labor power in order to survive, that’s the point when capital is fully mature and the capitalists finally preside over a capitalist system. When workers bring their labor power to market, they’re set into competition with other workers who are doing the same. The competition exerts a downward pressure on the price of labor power, also known as wages. Workers may be free to walk away from any deal with a boss, but they have to make a deal with some boss, and the next offer will probably look like the previous one. That’s because the boss will offer the going price — that is, the market price — for that kind of work. When American workers became a mass force for the first time in the 19th century, they began to put up collective resistance through demonstrations, riots and strikes. The bourgeoisie responded by upgrading their tools of legal repression, particularly by creating full-time professional police forces to control urban crowds. Oddly enough, though, the capitalists didn’t need to break much new legal ground to deal with the commodity of labor power itself. Most of the legal tools to deal with labor power came straight out of the laws that already dealt with contracts. As we’ve seen, a contract may be technically voluntary, but whenever the two parties begin with unequal bargaining power, their social inequality gets embedded in the very terms of the contract. This goes for work agreements whether they are legally formalized or not. As far as I know, American laws have never used a term that corresponds exactly to the concept of “labor power,” but the regulation of the market for labor power goes back to English common law. For example, common law treated unions and strikes as criminal conspiracies. When workers joined forces to raise their wages, they were engaged in a “restraint of trade.” You see, if workers are bringing their commodity — labor power — to market, they’re all supposed to be in competition with each other. To borrow a phrase from the labor movement, workers are “taking wages out of competition” when they take collective action by unionizing or striking. Workers’ persistence in struggle finally forced the Supreme Court ruling to legalize unions in 1842 (Commonwealth v. Hunt). Of course, workers have had to keep fighting ever since then in order to make union rights a reality. Other collective struggles have affected the labor market by political means, such as movements for minimum wages or legal limits on the length of the workday. Nevertheless, workers’ collective influence over the labor market is small compared to the bourgeoisie’s market manipulations. In the neoliberal period, since about 1980, the world capitalist class has pressed for “flexibilization” of the labor market, repealing laws that have created “rigidities” in the use of labor — such as protective legislation and many union rights. Those legal manipulations of the labor market are pretty obvious, but I’ll finish up by focusing on a special kind of intervention in the labor market that may not be so obvious: There has been a resurgence of distinctions of legal rank. If you’ve got a low legal rank, there’s a whole set of laws that are designed just to deal with you and people like you. Generally it means you’re missing some of the rights that other folks have. Bourgeois ideology condemns distinctions of social rank, but capitalism has never done without them. There’s the example of slavery, of course, but there have been persistent distinctions in the legal rights of adults vs. children; men vs. women; Blacks vs. whites under Jim Crow; gay vs. straight; farm workers vs. manufacturing workers; and unionized vs. nonunionized. Those who have fought for equal marriage rights know that there’s also a major difference between the legal status of married and unmarried couples. Such distinctions do harm to those in the lower ranks by limiting their civil rights, by depressing wages and living standards, or by exposing them to special risks. At the same time, distinctions of legal rank also skew the price of all labor power downward by sharpening competition and impeding collective resistance. Distinctions of legal rank have played an important role in undermining the gains that workers and African Americans made in the period of economic boom and social struggle that followed the Second World War. For example, as Michelle Alexander has shown, mass incarceration has created a “New Jim Crow” that makes second-class citizens out of the growing population of prisoners and ex-convicts, who are disproportionately African American. The greatest impact on the labor market probably comes from the status distinction between native-born and immigrant. Undocumented immigrants, of course, work under the greatest legal disability. Since 1980, the number of people worldwide who live outside the country of their birth has more than doubled, to about 230 million. Those are all non-citizens, and about 15 to 20 percent of those are undocumented. We can’t begrudge any worker the right to move in order to find a better life. The problems are not the fault of workers. It’s the bosses who constructed the legal disabilities of immigrants in the first place, and the bosses have deliberately manipulated the laws and enforcement to shape the working classes that they want. These policies have jacked up competition and division in the world’s working classes and thus have depressed the global price of labor power. Along with international migration, we should take a special look at internal migration within China, a country that practices a form of legal apartheid. When Chinese peasants move to another part of the country to take up wage work, they lose an important bundle of citizenship rights, and their children inherit their second-class status. As a result, the migrants became some of the world’s lowest-paid workers. The numbers are remarkable. Migration between countries has increased by 130 million since 1980, but China’s internal migration, by itself, is larger than that. Since 1980, about 220 million Chinese have stepped down in legal status to join the waged workforce. That’s more than five times the number of undocumented workers in the whole rest of the world. Since 1980, Chinese apartheid laws have cheated these new workers out of more than a trillion dollars in benefits. The corporations making money in China have benefitted from this two-tier system of social rank, and corporations outside China have benefitted because the “China price” for labor power helped push the world’s workers into a global race to the bottom. The irony, if you can call it that, is that this assault on the world’s working class has taken place under the neoliberal banner of freedom, equality, and the magic of free markets — just when bourgeois states were restricting the freedoms of workers, promoting legal in-equality within the working class, and engaging in massive manipulations of national and global labor markets. That’s not a very happy note to end on, but it’s the world we live in, and those are the laws we live under. So let’s open the discussion. English common law provided the basis for the American legal system. Common law developed out of English legal practice, backed by royal authority, without much influence from Roman law. The Anglo-American system places more emphasis on judicial precedent than do the national systems that are derived from Roman law. Alexander, Michelle. The New Jim Crow: Mass Incarceration in the Age of Colorblindness. New York; Jackson, Tenn.: The New Press, 2012. Ely, James W. The Guardian of Every Other Right: A Constitutional History of Property Rights. 3rd edition. New York: Oxford University Press, 2007. Finkelman, Paul, “Slavery in the United States: Persons or property?” in Jean Allain, The Legal Understanding of Slavery: From the Historical to the Contemporary. Oxford, U.K: Oxford University Press, 2012. Pashukanis, Evgeny. Law and Marxism: A General Theory. Reprint edition. London: Pluto Press, 1989. Outstanding analysis of the origins of law.